An artist's illustration of the European Space Agency's ExoMars 2016 Trace Gas Orbiter (left) and Schiaparelli landing module as they approach Mars for an Oct. 19, 2016 arrival. After seven months of space travel, the European Schiaparelli spacecraft is only a couple days away from making its final descent to the surface of the Red Planet — and the stakes are high. 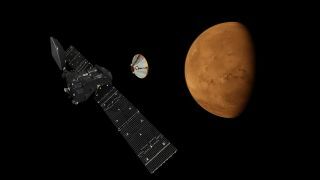 The Schiaparelli lander — part of the European Space Agency's (ESA) ExoMars 2016 mission to Mars — was launched into space with the Trace Gas Orbiter on March 14. In preparation for Schiaparelli's decent to Mars on Wednesday (Oct. 19), the Trace Gas Orbiter released the lander module Sunday (Oct. 16), with both craft now flying free in their daring approach to the Red Planet. What's more, ESA's mission control has only one chance to precisely time the orbiter's entry into orbit around the Red Planet, Denis added in the statement. The Trace Gas Orbiter will study methane and other gases present in Mars' low atmosphere. This information will help scientists better understand any geological and biological processes on the Red Planet, including life. As the Trace Gas Orbiter flies over Mars, the Schiaparelli lander will study the Martian surface in preparation for the life-hunting ExoMars rover mission scheduled to launch in 2020. The module is on track to land on Mars. If everything goes according to plan, it will touchdown in a region called Meridiani Planum, which is near the planet's equator. However, landing on the Red Planet is no easy feat. Last week, the Schiaparelli spacecraft received its landing commands, which include discharging the front and back aeroshells and deploying the craft's descent sensors, braking parachute and thrusters for a controlled landing. The lander will have only six minutes to slow down for a safe decent to Mars. "This week, we uploaded the commands to fully charge the lander's batteries and prepare the orbiter's data-handling system as well as power and thruster system for separation and the subsequent trajectory tweak," Peter Schmitz, spacecraft operations manager, said in the statement on Friday (Oct .14). "Next week, before the big burn, we will place it into a special 'failop' mode to minimize any risk that an onboard glitch could interfere with the firing of the engine, which absolutely must happen at the planned time for us to get into orbit."